Calling all beauty lovers out there if you are looking for a sunscreen that won't grind your gears. I have been using this for months. And I just the chance to blog about it today. Boo-hoo me for not sharing to you guys earlier. Because this stuff is amazing and make hugeee difference in my makeup routine. I still love my Yadah Sunscreen which I mention before. One of a sunscreen that does not leave my skin greasy and leave that uncomfortable feeling.But then I discover more great sunscreen for you to try out and for me to suggest to you. As I mention in my before post, sunscreen is IMPORTANT. Even doctors say pressure people about this. A sunscreen is a must have product in your skincare routine. So lets get started on what are these two sunscreen that I have been loving. 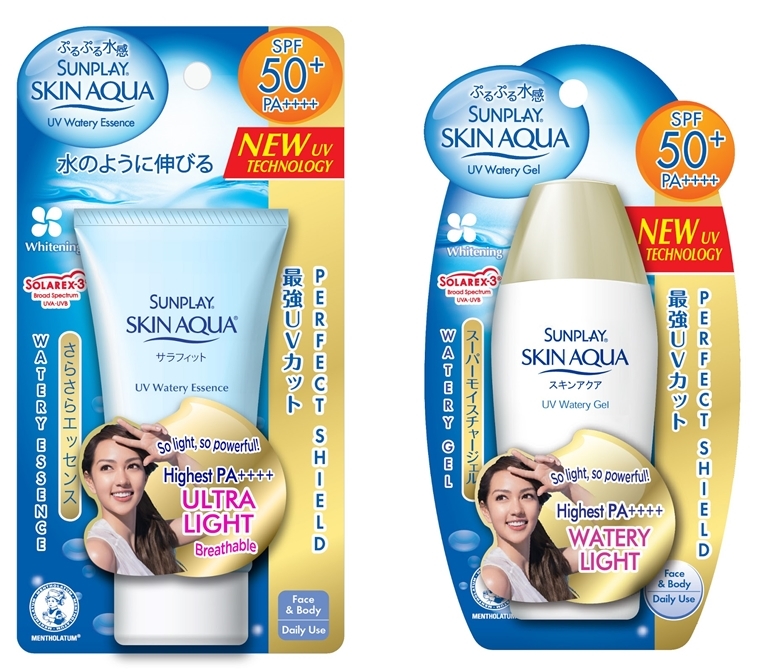 It is the SunPlay Skin Aqua UV Watery Essence SPF50+PA++++ & SunPlay Skin Aqua UV Watery Gel Sunscreen SPF50+PA++++. Both are from a brand call Mentholatum in their SunPlay range. It is said that these sunscreen or you can also call it sunblock or sun protector is formulated with the new Solarex-3 technology that provides you with photo stable protection against the sun’s damaging UV rays which is proven to resist photo-degradation 3x better. It also contains Vitamin C which reduces melanin formation, effectively lightens freckles and dark spots as well as evens out skin tone for a more even and radiant skin. 3 ingredient highlight that is RonaCare Ectoin, Antileukine 6 and hyaluronic acid. that has good moisturising effect, repair and enhance your skin’s ability to protect your skin from UV rays as well as protect the skin’s DNA from damage. What I like about it. The price is afforable for such a good sunscreen. Almost most of had the experience of oily/greasy skin when applying sunblock and makeup on top. This does not do that as it is actually a great sunscreen that also acts like a great base for your makeup. My makeup last longer and nearly matte all day. Easy to spread out and absorbs quickly. No white cast effect. No weird smells or that typical sun block scent too! What I don't like about it. Maybe I don't really like the blue tube packaging as much because if I forget to close it properly it tends to splits out and create a mess. The plastic is a bit flimsy too. Maybe this is my own problem for begin too brutal & hasty when using product. Haha. Overall & Recommendations. Really recommend these two for you who have combination/oily skin who are looking for a affordable good sunblock. Its super light weight, feels like applying moisturizer on the skin and price wise are affordable. Both works great on my skin but my favourite is the blue tube one (Essence) even tho no really like the flimsy tube. It is easy to obtain because I think nealy all pharmacies offers Mentholatum, SunPlay products. Love this! Have you found a sunscreen that is not oily like these? Never bought this but the name of this sunscreen is really catchy! Let's play with the sun!! oh yes, yg biore bottol biru tak salah sab. tu pun best gak! Let's have a try with this..
hi dear ester, sorry for the late reply, was really busy. you should apply sunscreen after toner. the function of toner is to help your skin have that "damp" texture. this way it helps to absorb the next product that you are using, sunscreen,moisturizer/serum better. if you feel like it is too much. try to find a foundation that has spf in it. and try to use a "spray" type of primer. kalo pkai sunblock yg ade alcohol, takpe ke ? sbb sye ade bce yg alcohol tak elok utk muka ? Can used on body too right?